In this post you will find a list of different programmes available to clubs and schools in the upcoming year! Green Shoots is a national programme run in conjunction with Basketball Ireland (BI) and the BI Development Officers. 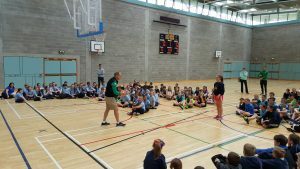 The aim of the programme is to develop fundamental movement skills and implement a Long Term Athlete Development (LTAD) plan for Basketball Ireland. The Green Shoots Programme is designed to be a fun, enjoyable social activity for children and to improve the skill level of each player. Green Shoots is ideal for clubs and any club interested can get a free session where the development officer will visit the club and run a sample session which all club coaches are invited to attend. The club will get booklets or a pen drive with all the drills and information on how to run a Green Shoots programme and the ability to purchase discounted Green Shoot kits for the kids. The development officer is available to attend any school in the region to run an age appropriate coaching session. Special guest Pete Strickland dispensing some coaching advice to the children. All primary schools who participate are invited to the end of year schools blitz. 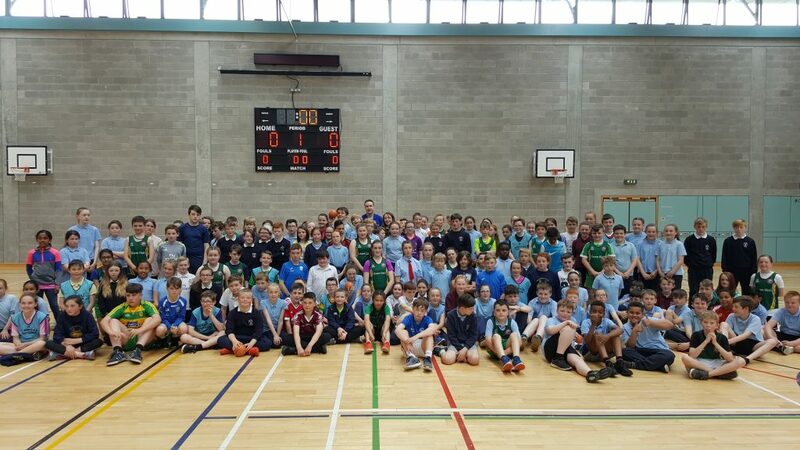 Last year we had 18 schools and almost 200 children participate in the end of year blitz in the LYIT with special guest Pete Strickland. a Mini Blitz is organised for end of January 2018 and there will be a full blitz again towards the end of the academic year. 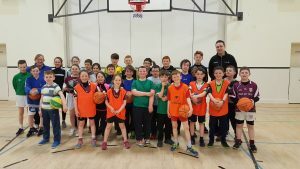 Basketball Ireland Development Officers participate in the Active Schools programme and are available to attend any primary school during the active schools period in Spring. Boys and girls who participated in the 2017 schools blitz day! Jump Together is a programme designed to pair local GAA clubs with Basketball clubs. The programme consists of 4 funded sessions which are filled with GAA/Basketball crossover drills and games designed to improve skills which are essential for both sports. It is hoped after the four sessions a longer term relationship can develop between the clubs. The development officer is available to help assist and run 3×3 tournaments for any age group. 3×3 is now an Olympic sport and tournaments can be run at any age level for male, female or mixed teams. Development officer can run a demonstrating explaining the specific 3×3 rules and set up the tournament format. This entry was tagged 3x3, Green Shoots, School Visits. Bookmark the permalink. 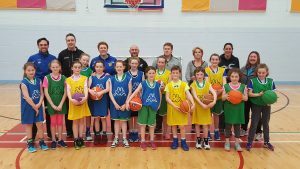 ← Paul Carr and Green Shoots Growing Basketball in Dungloe!